Somewhere along the way the family room became the shining star. Let’s go back a bit. Mid-nineteenth century architecture focused on compartmentalization. Every room had its own defined space. The 1980’s spawned an era in architecture which is still standing strong today: the family room/kitchen concept. How did we get here? Well, the formal living area was replaced with the home office while the kitchen and family room areas were expanded. We built this home in 2013. A concept still going strong for some thirty years extends beyond trends and moves right into permanence. No matter the price point or location, the single family home landscape in America is dominated by the family room and kitchen joined together as the focal points. Today, I want to share with you our own family room. This is where we do everything together. From random movie nights to the big game on Monday, Thursday, Saturday and Sunday (yeah, I am making fun of my hubby), this is our spot. We wanted this space to be warm and welcoming but also have a sense of design. Not only do our friends and family find the space to be inviting, but so do our furry family members. Yep, we have to fight them for spots at times. We chose this floor plan for a variety of reasons. One of the major aspects of this design that we fell in love with was the fact that it lends itself to our lifestyle. We love to entertain. We needed this room to be large enough so our guests would feel comfortable without lacking the intimacy that our family prefers. I for one am thrilled that the reign of the family room is still going strong! I hope you enjoy the tour. We wanted to create a cozy environment with plenty of seating. The chaise is a favorite spot. 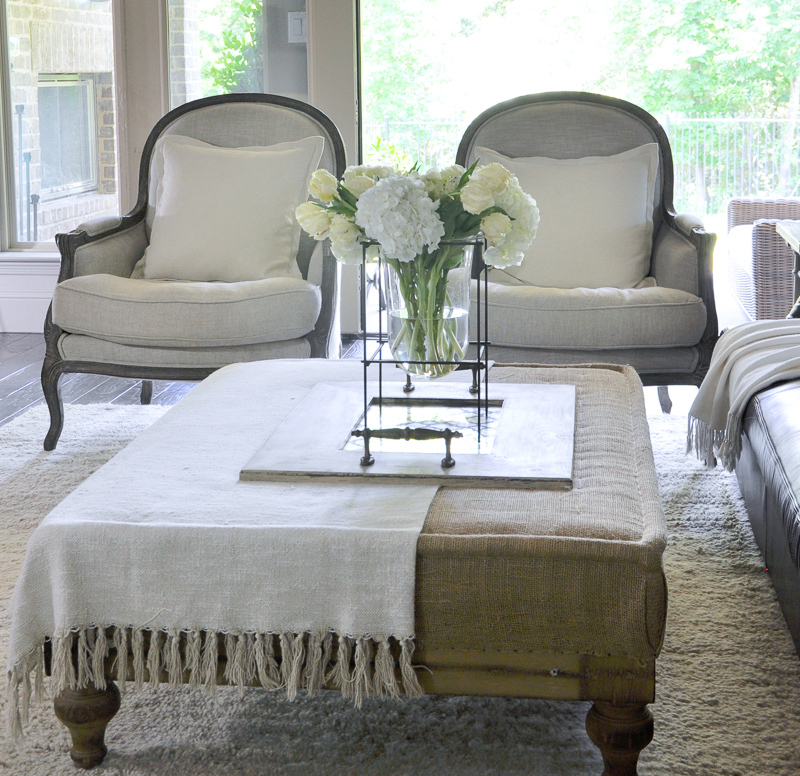 The arm chairs prevent the room from being overly casual, but are still very comfortable. The sofa is a distressed brown leather. 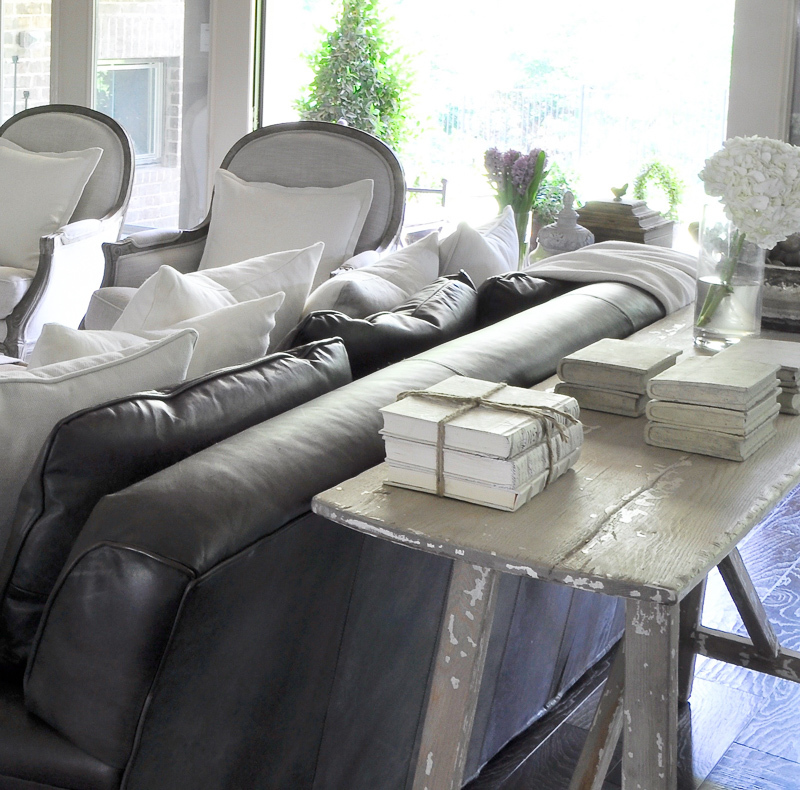 You can see the leather here along with our sofa table. 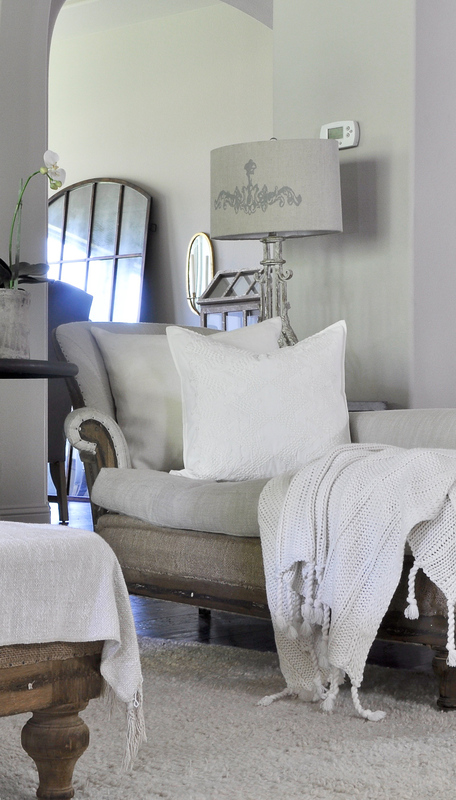 I added down-filled white linen pillows and a soft soft white throw to lighten the space. Because the family room is open to the kitchen and breakfast room, I wanted to make sure the decor flowed from one area to the next. The view from the kitchen includes a clear shot of the television, which is a must for my husband who needs to watch sports. All. The. Time. Can anyone relate? I’m happy with a view of my favorite mirror over the fireplace. 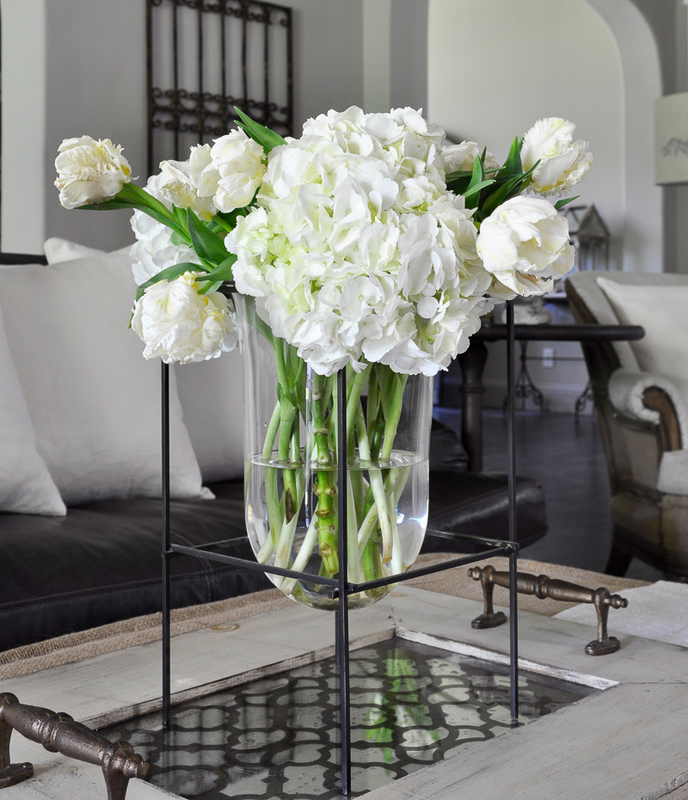 A couple of details…I always include fresh flowers and this tray which migrates from room to room. You may have recently seen it in my dining room tour. Last, but definitely not least, our floor plan called for windows where you see french doors. This proved to be the best decision we made prior to construction. Thank you so much for visiting. If you would like weekly updates, please consider subscribing to our newsletter. You can find a full source list here. *Some similar items have been substituted for unavailable items. 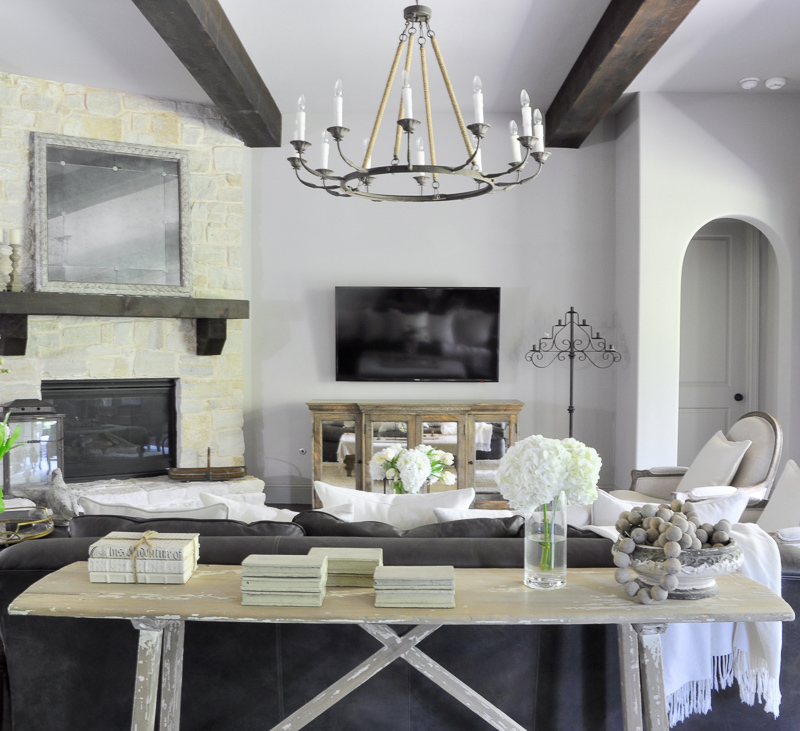 Jen, I’m in love with your home and this room! It’s so nice to see different angles we don’t normally get to see! Beautiful my friend! You are so sweet Tamara! Thank you my friend! Jen, this is so gorgeous!! Perfect balance of comfort and design!! Lovely tour, Jen! I love your gorgeous style and your photos are spot on! Aww… thank you so much Kim! You are so sweet! Simply gorgeous! Totally random question, where can I purchase that vase? I didn’t see it listed on your sources page. Thank you Shondra! The vase is from Pottery Barn, but I’ve had it for over ten years and they no longer sell it. Sorry! Jen, what a beautiful home! 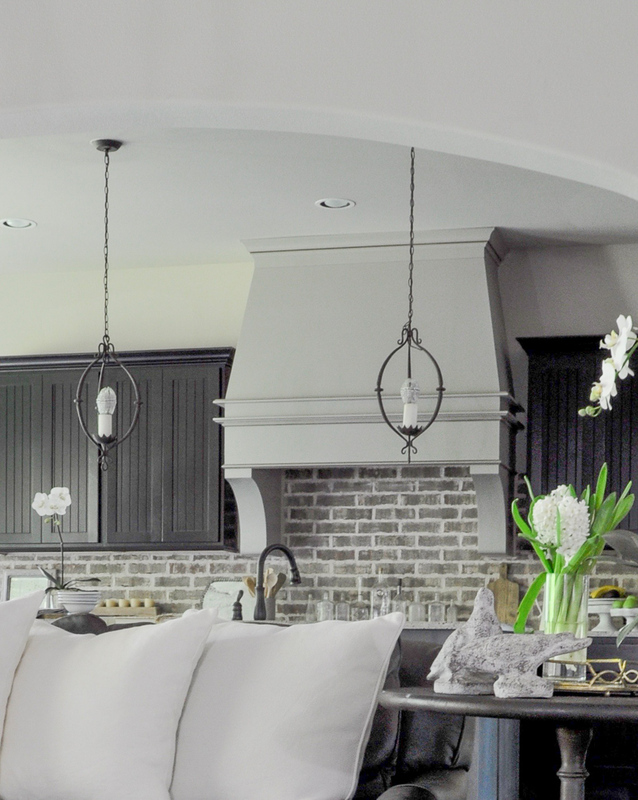 I love the open concept of the kitchen flowing into the family room & coordinating the design. This has been on my dream list as ours isn’t fully open like yours. I love to entertain too & bet your family & friends love being in the space! You are so kind! Thank you! There is definitely a benefit to an open floor plan while entertaining, but I do miss the architectural features you sometimes get with other styles of homes. Love your home. Absolutely gorgeous and inspiring. 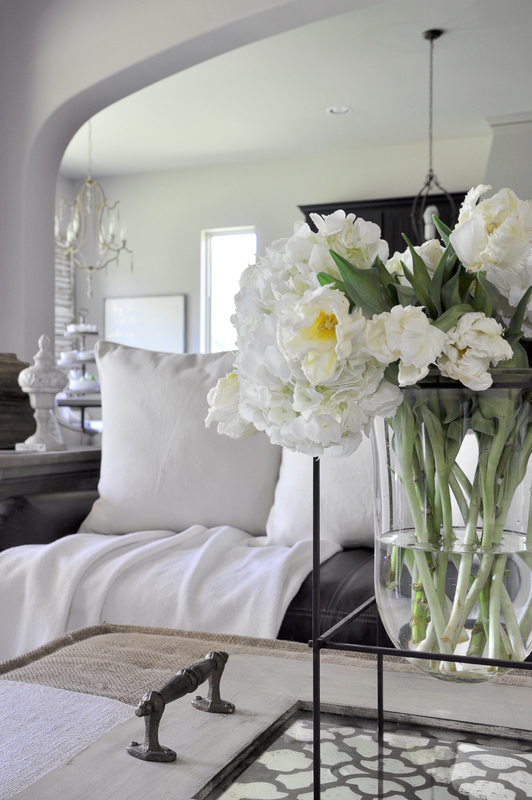 Question on the amazing floral arrangements… do you use faux arrangements at all? If so, do you have a go-to for where you purchase? Some that I’ve come across seem too fake… Thanks!! Hi Donna! Sorry for the delayed response and thank you so much for your kind words! I use both faux and fresh flowers. 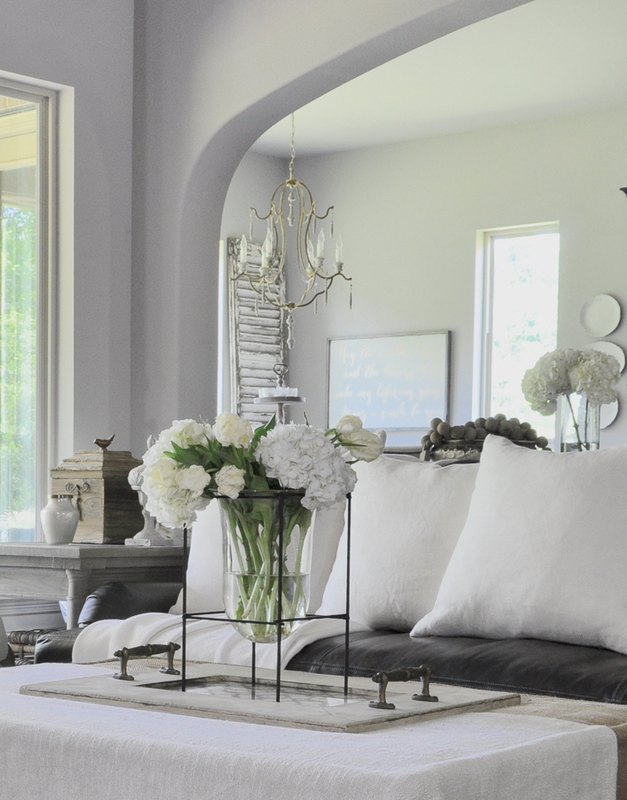 I have found a few nice faux arrangements over time and I’ve linked them on my sources page under the family room category. They don’t look fake at all, which is important to me too. Hi Kathy! The brand is Pittsburg. It’s a custom blend that started with Silver Dollar. I hope this helps! Hi Jennifer, I just love this home! 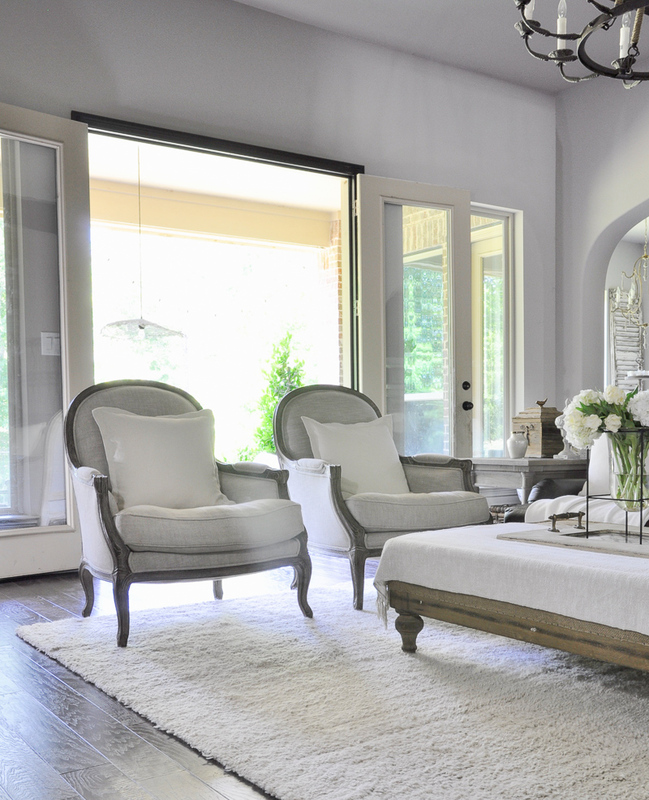 I especially love the comfy chaise, will you tell me where I can find it? Its closely relayed to my 2 Restoration Hardware dining chairs. Thank you! Hi Holly! Thank you!!! It is from RH, but I’ve had it four years and I don’t know if they still make it. The last time I checked I couldn’t find it on their site, but perhaps they’ve brought it or something similar back. Love, love, your design! However, I hope that I don’t embarrass myself by asking this question? Why do you cover your coffee table with a throw? I am not a professional designer, so I love following all you ladies and getting ideas for my home.. Your photos are always amazing! As a newbie blogger, Please can ask what camera do you us? I absolutely love your style! 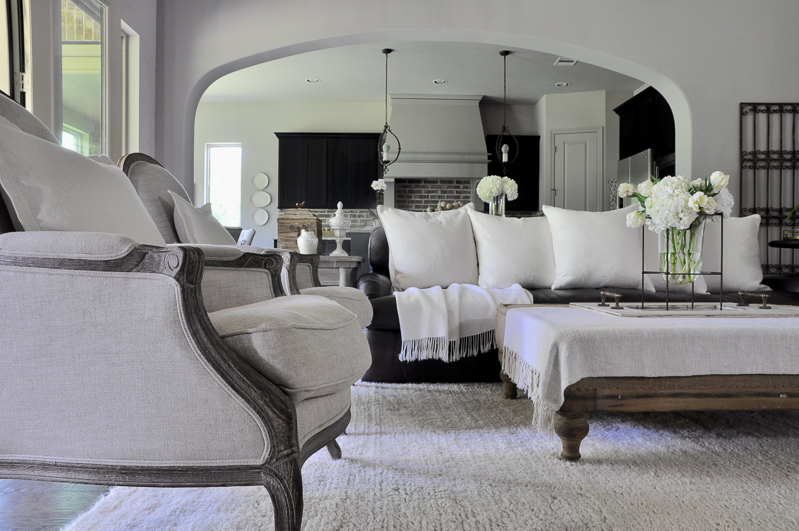 Your family room is beautiful yet looks very comfortable! I have a question about your console. I’m assuming all your TV equipment is inside. Does your remote work thru the glass or do you have to leave the doors open when your watching tv? Thank you Maureen! That’s a great question! For this photo shot, I moved the equipment out of the shot. That said, we are currently in search of a solution that does not require the equipment to show or the door to be open. I’ll definitely post good options here when I have some. You are welcome! The uniqueness definitely makes me want to keep it, but perhaps in another spot in our home. Love your all white room. I too have one. I am wondering what fabrics you used on Upholstery. I have perennials white velvet and it is proving hard to keep clean. Blue jeans and shoes against fabric!! !